What’s bad: This is not a substitute for a headlight or a camp lantern. 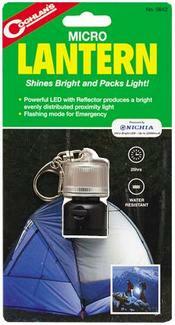 The light tends to get lost in large open areas, so do not depend on it to light up your campsite. Also, it cannot be used as a primary light source for night hiking on any remotely technical trails or for any other tasks that require a direct and focused beam. What’s the bottom line: In this day and age of fast and light backpacking, every ounce counts. This ounce is worth its weight in the pack. Although it is not an essential piece of gear, it is one of those nice to have items that, in fact, do serve a purpose. Given its size and weight, you won’t regret packing the Micro Lantern. In the Box: Coghlan’s 0841 LED Micro Lantern, with batteries inserted. Performance: I tested the Coghlan’s 0841 LED Micro Lantern during a June backpacking/climbing trip in Colorado’s Rocky Mountain National Park. We hiked approximately 6 miles into our backcountry site base-camp for 3 nights at 10,600 feet. In terms of general performance, the micro lantern is compact, light–weight and easy to use. Every piece of gear carried in your pack serves a specific purpose and must perform as designed. The micro lantern does that. As noted, this cannot be used as a primary light source during nighttime campsite activities or hiking. However, it does effectively light small areas. I found it most effective either hung directly over camp stoves while cooking or inside the tent. In both cases, the micro lantern is hung using the carabineer clip for attachment. The clip is quite small, so attachment to large rope or straps is difficult. Although I did not test it, I believe the micro lantern could be effective as an additional light source hung from the back of the back. This use could benefit trailing hikers. I tested the emergency strobe feature (fortunately, I didn’t actually need it) and found it visible from a significant distance. I did not test this feature in open terrain, so distance measurements were not approximated.